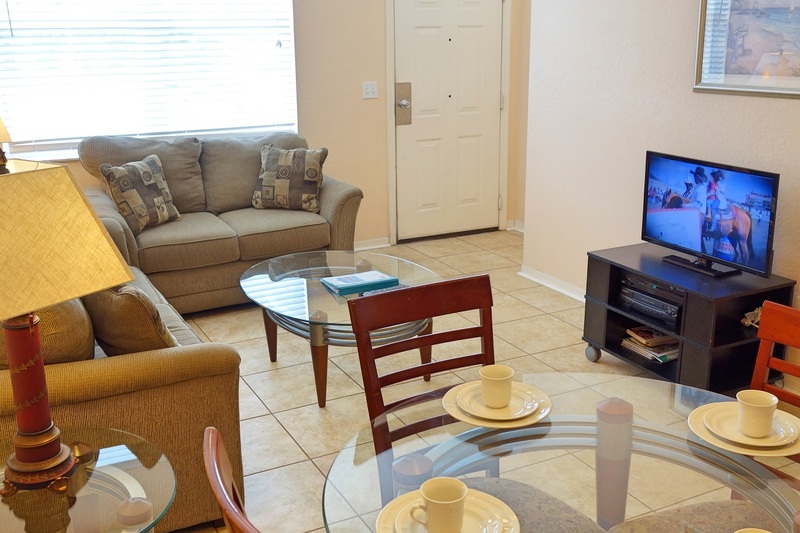 Ventian Bay Villages is just off HWY 192, in Kissimmee, Florida and is perfectly placed for the shops, restaurants, fun and attractions that Orlando has to offer. Venetian Bay is ideally located as a "home base" for other Florida activities including the Space Coast or the Gulf Coast. 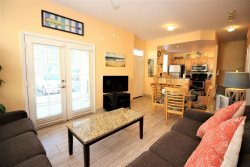 With 3 bedrooms and 2 bathrooms, this fully air-conditioned, family friendly vacation home is perfect for families or for a few friends golfing or vacationing. This Vacation Home has a spacious family room to relax in during the day or evening, cable TV, and DVD player to enjoy your favorite movie. The family room is open to the Dining room and the kitchen so that you can socialize while enjoying a great meal prepared in your own fully equipped kitchen. Spacious sleeping accommodation awaits you with 3 bright and roomy bedrooms. The main floor master bedroom has a king sized bed and a TV. It opens onto an attached ensuite bath with a big shower and a deep, jetted tub. Upstairs, there are two more rooms with two twin beds each. The twin rooms share a hall bath with tub and shower. There is even a queen sleeper sofa, for when your group needs a few extra spots to lay their heads! Make use of one of the four community pools including the huge, heated pool at the clubhouse. Make a day of it at the clubhouse pool and enjoy a bar-b-que at one of the provided grills. Let the kids frolic in one of the three awesome playgrounds. There are also tennis courts, a basketball court and a sand volleyball area for your enjoyment. The clubhouse has a well equipped fitness room, games room, computer room and movie theatre! Take a walk on the paved pathways to enjoy the grounds, beautifully lush with trees and gardens as well as several ponds, and a great covered gazebo overlooking the fountain. Feel safe during your stay at Venetian Bay as it is a fully guard gated community with great staff. As well, there is a local management company just a phone call away in the event of an emergency. Excellent, will definitely be coming back next year! My stay was excellent. I licked the key back into the lock box and left property at 9am. We will be back. Extremely friendky and helpful staff. The condo was perfect for our needs and an excellent home away from home. Property was clean, and spacious for my family, very pretty place and well maintained. Will definitely stay there again. Thank you. My daughter & I enjoyed working on a very difficult puzzle together. We didn't have time to complete it. Your team has always done their best to keep us happy and fill any requests that we have had. We have looked into staying at other properties and have always found this to the the best value by far.